The Heathkit SW-7800 is a rather obscure shortwave receiver. Some stated a poor receiver and another stated a horrible receiver. However, I disagree after owning about 50 vintage receivers with some in the same price class. On the other hand, a few simple modifications makes for a fine entry level receiver. (Google SW-7800 modifications). The modifications includes shielding the frequency counter ribbon cable and a resistor easily soldered on the audio driver resistor. Do not replace the detector diodes per some posts. Audio response is poorer. (Google SW-7800 mods). For lower audio frequency response, replacing a few capacitors performs well. But, this is not necessary. The SW-7800 is an analog design with a frequency counter. The analog design makes for no phase noise and the IF is fairly quiet. I owned a Kenwood R-2000 and frankly was miserable to listen to on AM due to PLL phase noise and a noisy IF section. I prefer the SW-7800 for AM SWLing. And, although missing a noise blanker, I never needed it on this receiver for AM use. Doe to the SW-7800 using an analog tuning capacitor, about 1-2kHz drift is present at warm up. After about 20 minutes drift is minimal. The frequency display is far superior to an analog dial for finding shortwave stations. The built-in speaker sounds good and performs well in the voice frequency range. Two AM filter sections are available on the front panel of 6kHz and 2.5kHz. For the most part I use the 2.5kHz ceramic filter on AM. The wider filter skirt design does provide good quality receive plus reduced band noise. Compared to a restored and aligned tube type vintage Hallicrafters SX-43, the SW-7800 is superior. A random wire antenna of 20 feet was used in the test. If you get a chance to pick up the SW-7800 in the `$75-$125 range, but it. Estimating the value of a rig can be challenging. 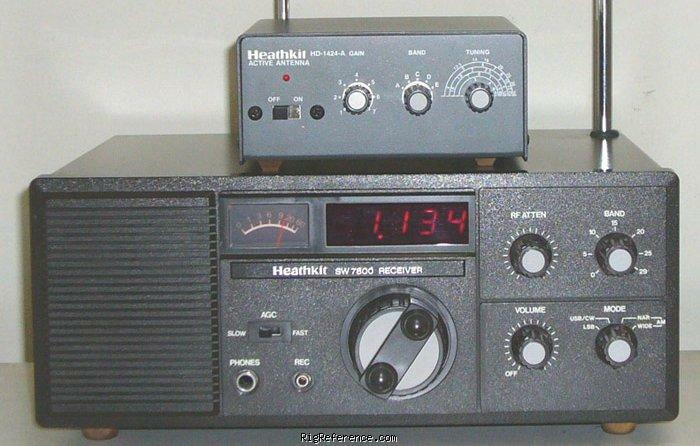 We collect prices paid by real hams over the years to help you estimate the current value of the Heathkit SW-7800. Just bought or sold this model? Let us know what you traded it for and help other ham operators!